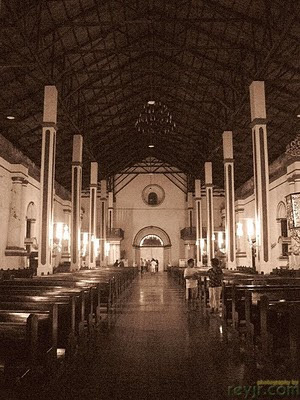 We arrived in the evening at one of the most beautiful and well preserved Catholic churches in the Philippines, the Paoay Church for the wedding rehearsal of my friends Eg and Ryan. They were getting married the following day. There was a chorus of exclamations when we got out of the jeepney. 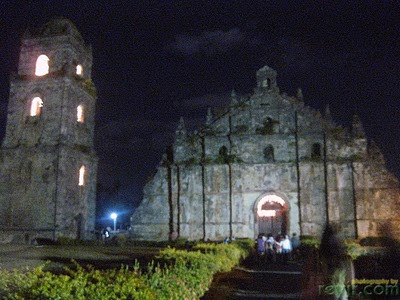 The lighted facade of Paoay Church was magnificent in the darkness. The interior was surprisingly quite plain - but it was huge. 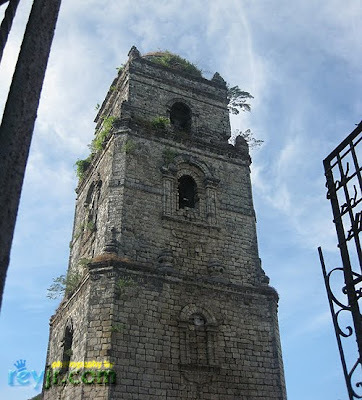 According to WikiPilipinas, "the Paoay Church is a unique combination of Gothic, Baroque and Oriental designs. Its facade reveals Gothic affinity, its gables show Chinese elements, while the niches topping the walls suggest Javanese influence." 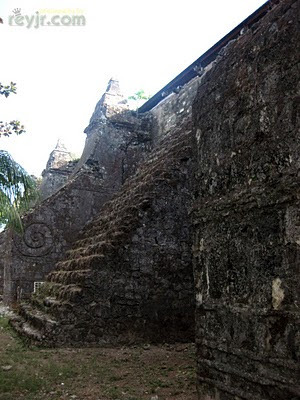 It is also known as the “Earthquake Baroque” church in the Philippines mainly because of the strong buttresses built to support it. Try Herencia de Paoay's Pakbet Pizza, with Bagoong! 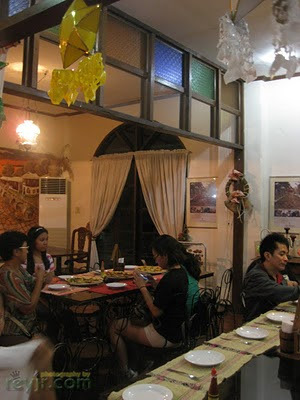 For dinner, we went to Herencia de Paoay, right in front of the church. It was quite interesting to try out their Pakbet Pizza (complete with bagoong! ), the Bagnet Pizza, and the Dinuguan Pizza. Yes folks - unique and very Filipino. A must try when you visit Ilocos Norte! The restaurant was not very big - can fit maybe 30 to 50 people. But it was cozy and homey - and the food it great! Try the noodles too! 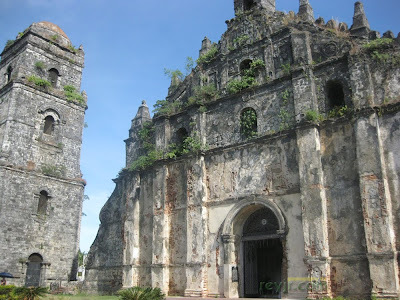 The following day, while waiting for the wedding of Eg and Ryan to begin, I walked around and took some more photos of the baroque church - one of four churches in the Philippines listed in the UNESCO World Heritage Sites. 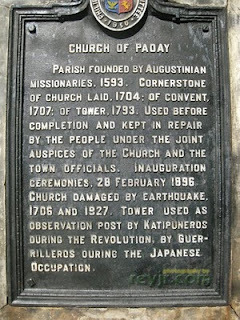 From the dedication on the door, it states the bell tower which stands separate from the church, was used by Katipuneros, and that it was first completed in the 1800's. I was wondering at first why there were concrete stairs on either side of the church. Apparently it was designed that way for typhoons and floods - great idea. Galing no? There is much history in this place. The church was also designed to withstand earthquakes - but just in case it cannot, they've built the bell tower separate from a church a few meters away to protect it. Here's a view of the bell tower from the side of the church. Here's a photo from inside - beside the choir area in the front of the church. I liked the colors of the window. When the wedding ceremony finished, the sun was just about to set. 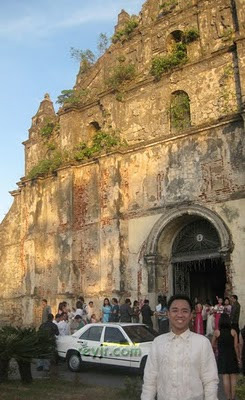 It gave a wonderful golden glow to the facade of Paoay Church. You can also see the moon in this photo! And finally, proof that I was there. Hehe. Read more of my Travel Blogs here. Rey, these are awesome pictures, ang tanda na ng church. It speaks of history throughout the ages. Thanks for sharing this with us. I was wondering, nagpunta sila doon para lang ikasal? how romantic naman. and by the way, you look good in your barong...lol...cheers. 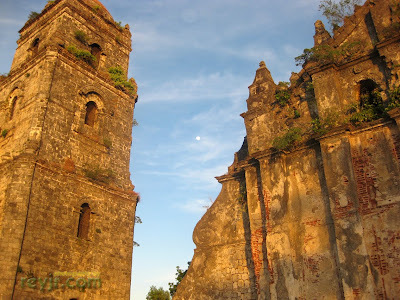 I've been to Ilocos but our family visit was too brief. It was more of a driving trip than just stopping by to really take a look at the different places - I was with my old folks and they just simply prefer to have me drive around than stopping to visit at these wonders. Nevertheless, visiting Ilocandia was a refreshing break for me too. At that time I was a full time engineer working in shifts (and holidays) in a semiconductor company. No, I'm not an Ilocano. Siguro I'll be able to contact you and ask around for the best landmarks to visit when going places - when we get to be in a road trip again. 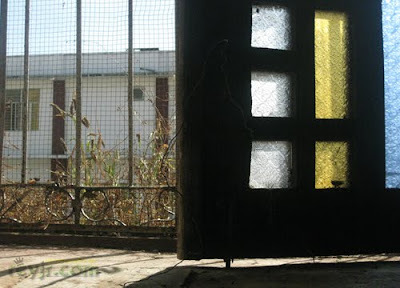 My aging parents just want to see places - yun lang.. but I exactly know how to get to those places. I bought the domain. I have so many projects but I'll have that up soon! Excited for that. How's the weather there now? I read in the news that it's down to 10 degrees. Brrr! Quite warm now. I miss the cold. Our place's supposed to get cold until the first week of March. GREAT pictures, Rey (I especially like the one with you in it, there at the end.) What fascinating architecture. "Earthquake Baroque," eh? One of a kind, I think. Thank you Holly! I am wearing our traditional Filipino formal wear called the "Barong Tagalog" or "Barong Filipino". Earthquake Baroque Church - haha, can you just imagine how many devastating earthquakes they had to go through before that for them to really deliberately make the new church Earthquake proof?